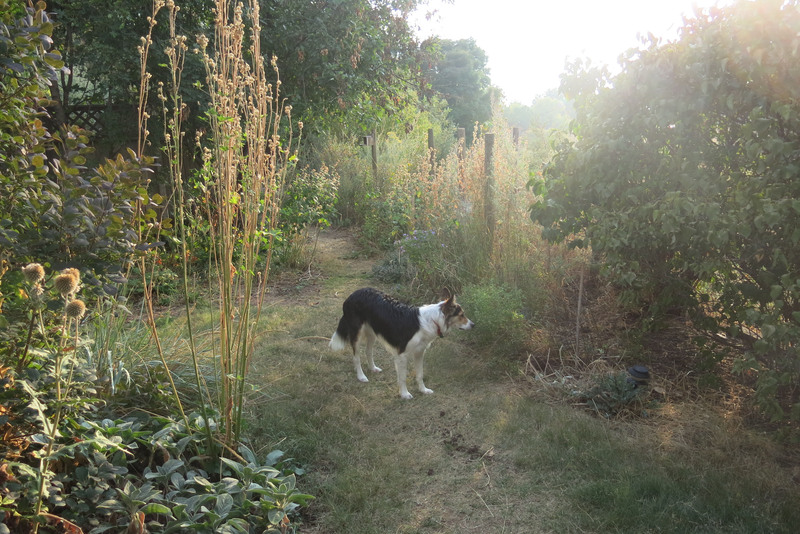 Greetings and salutations, everyone; yes, once again it is I, Mani the somewhat less than large purebred border collie, filling in for the guy I live with, and here to bring you the latest news from our garden. You may remember me from such posts as “Who Chewed The Hose?”, among so many, many others. Here I am in a characteristic pose. This isn’t a horticultural pose per se, more like a squirrel guarding pose. I’ve been making sure the squirrels don’t come into the garden, which is an important duty. What you don’t see in the picture above is all the pods that have been raining down day after day, when the squirrels sit in the honey locust, there on the left, and chew on the beans inside the pods. The pods got raked up this afternoon. The guy I live with has been raking pods almost every day. I said before that all the purebred border collies who live here before me liked to snack on the pods, but I think they’re an acquired taste. Here’s another view, taken through the native grape vine, Vitis riparia. I’m not in this picture, which is why it isn’t as interesting. There are grape vines everywhere, but this is the oldest one. He also says he doesn’t know why he doesn’t make dolmades with them. I don’t know what dolmades are, but he says they’re good. Something you do with the leaves, and something to do with eating. I like most things that have to do with eating. Once again, hardly anything has been happening. Besides the pod raking.The guy I live with said we had some internet trouble, which I guess you can’t tell from where you are, and so that’s why I haven’t posted in a while. Someone is coming out tomorrow to check everything out. I think the biggest deal here is the ongoing horticultural crisis concerning this bed right smack in the middle of the lawn. 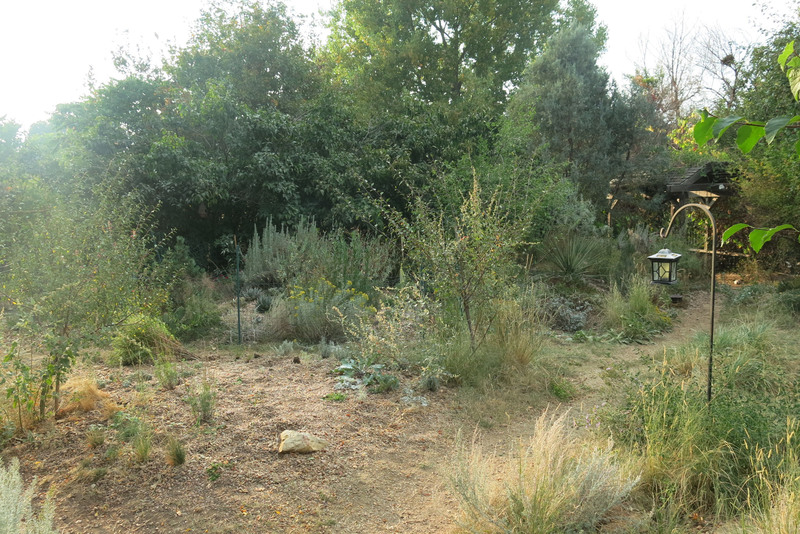 The guy I live with says all the plants are the wrong ones, and there’s too much gravel, and not enough native grasses, and so on and so forth. I wonder what horrible thing is going to be done here. We’ll see, I guess. 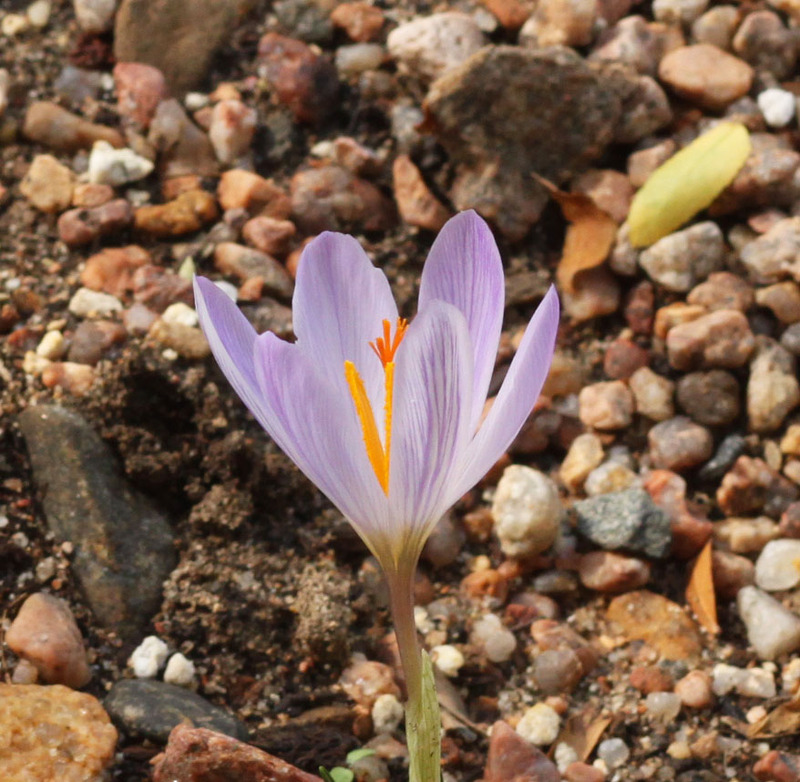 The guy I live with says the garden is “an awful mess”, though there are crocuses blooming here and there, but I guess that’s because it hasn’t rained here since the eleventh of July, which I hear is a long time for it not to rain. 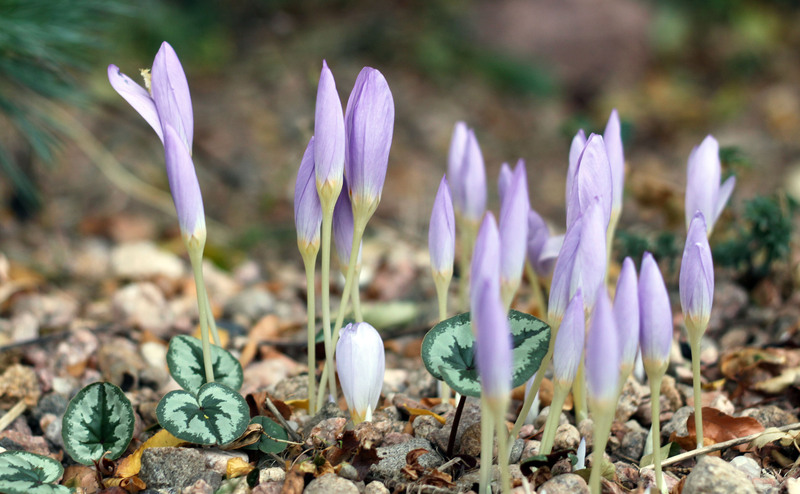 Crocus kotschyanus ‘Reliance’ with leaves of Cyclamen coum. According to the guy I live with we were supposed to get a severe thunderstorm last Friday, with inch-diameter hail and a tornado, but that didn’t happen, for which he was extremely grateful, but he said that maybe we would get some rain out of it anyway. We didn’t. So things are ultra-crispy in a lot of places. 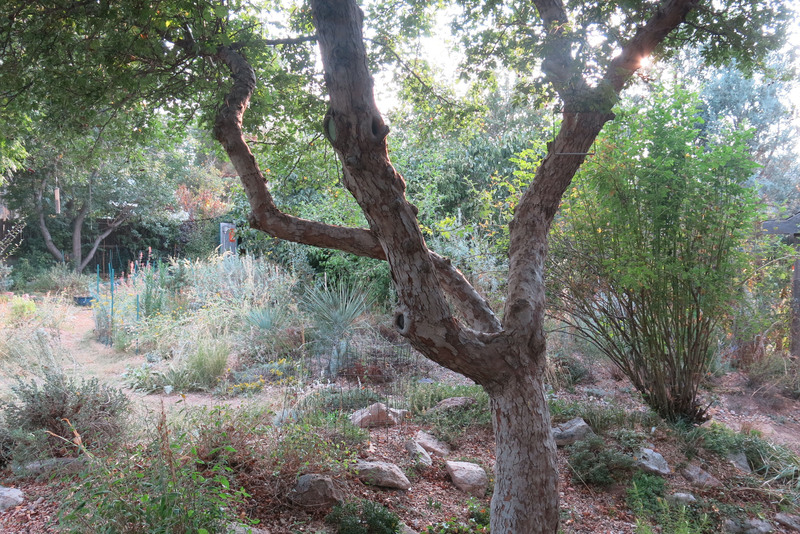 Here’s a view looking over the dry rock garden. I forget what it was I was looking at. Here’s the Russian hawthorn, Crataegus ambigua, and the “regular rock garden”, which needs to be watered, but hasn’t been. Here I am out in the “way back”, on my private lawn, looking at whatever it was that was done out here today. There was quite a bit of digging and planting out there, which is why there’s a bunch of dirt on my private lawn. The poles are for great horned owls to perch on, but I haven’t seen any do that. I know it used to happen. It could very well be that I’m so deadly and vicious that the owls are afraid of me. If you walked past me and then turned around, this is what you would see. I’m not in this picture, if you couldn’t tell. That was a grass path this spring. It isn’t now. That box was a squirrel feeder but the guy I live with said the squirrels were so stupid they chewed the box to pieces instead of just lifting up the lid. One squirrel figured out the lid business, but others wrecked the whole thing. 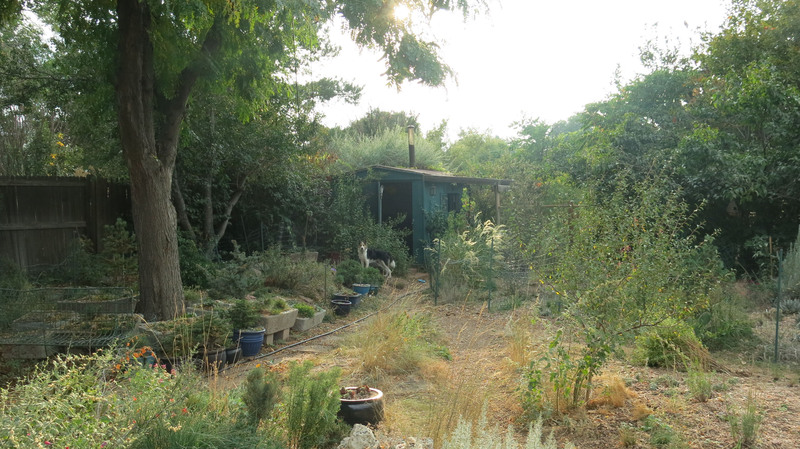 If you turned and looked to the right, you’d see “the enclosure”; there’s a hose going in there because that little garden gets watered regularly. The guy I live with says it will be filled with crocuses in a little while, but that I have to keep the rabbits out. I think I can do that. 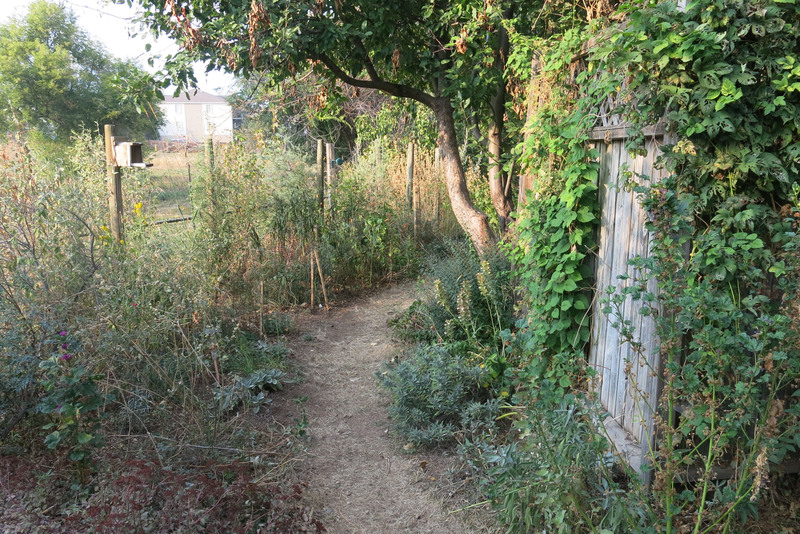 Farther up the path, there’s Salvia azurea, which the guy I live with says is really hard to grow here, since if it doesn’t die, it just falls over and flowers on the ground. The guy I live with says it would be extremely excellent if the stems stayed upright, and that maybe it’s a lack of phosphorous in the soil, which causes “lodging”, meaning the stems flopping on the ground. 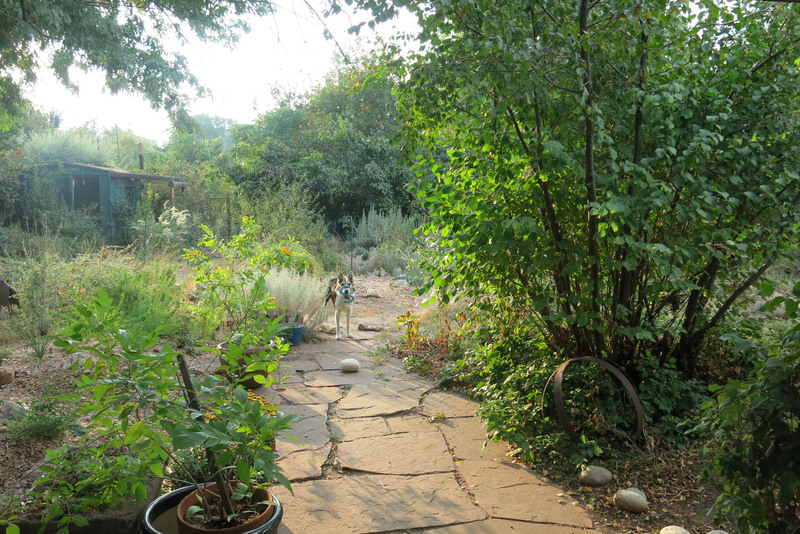 A lot of soils in Colorado are said to be low in phosphorus, which is a good thing for native plants that rely on mycorrhizae to endure drought, because phosphorous is bad for the beneficial fungi, but that also a lot of gardens have very high phosphorous levels because of all the fertilizer put on them. Well, so really that was just a bunch of pictures like the last bunch. But more with me in them. To finally get to the title of my post, because I’m a chewist, and have shredded most of my toys, which I confess I prefer, because then I can throw them around better, the guy I live with got me a new toy, which he says would stand up to my deadly gnashers better. I really like it. I forget who made it, but he said he got it at Whole Foods. I’ll leave you with a picture of me and my new toy. There are some other toys in the picture there, too, because like Chess, the purebred border collie who lived here before me, I love to have a lot of toys. Hi. I didn’t get one today, because one hasn’t been proffered. I heard there were some Honeycrisps in the basket above the sink, but nothing has been done about it, which seems kind of pointless to me. That new toy…is that “s” for super? Does it squeak? That salvia is a beautiful blue. Is it that turquoise in real life? We pretty much don’t fertilize anything anymore. We kind of just chop everything up and put it back so I hope things even out that way and the soil stays fertile. It seems like everything we do to make things “better” just ends up interfering. When we lived in the woods you could turn over some leaves and see the strands of micorrhizae everywhere but not here. So, what about Earl? Does he stay well away from the house now? You keep saying how dry the garden is but it doesn’t look dry at all. It looks very lush. No, the new toy is this fancy rubber-type thing that is supposedly chew proof. Chew resistant. I’m not sure I know anything about Earl. The guy I live with just said that was the name of a squirrel. No, most of the squirrels here are so totally terrorized, by yours truly, that none dare light on the ground. 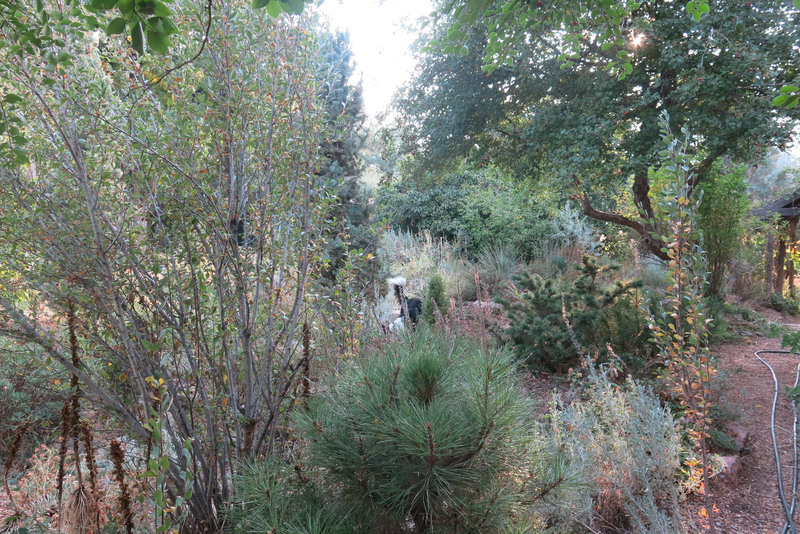 The garden really is super dry, but the autumn light makes it look less dry. Some watering has been going on, but not a lot. I can see blue, and the salvia is actually a darker blue than the camera made it out to be. But it flowers on the ground. We have had good luck with the Kong Extreme chew toys and an original large red Kong has survived 6 giants and a doberman. Original style DuraChew toys by Nylabone also last a very long time. All fabric based toys fail the chewist test. 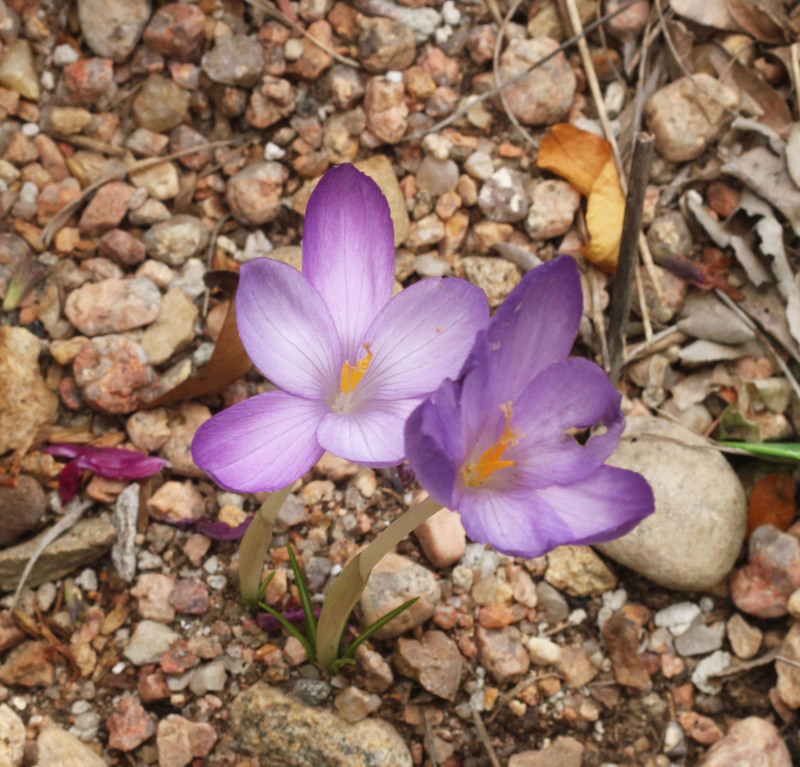 Can’t understand why you still have crocus in the garden with the evil squirrels in the hood. The blue chew toys work pretty well. Squirrels are denied access to the ground thanks to my deadly vicious gnashers. I have been wondering about you and looking at Facebook for updates, too. I hope your internet gets better. 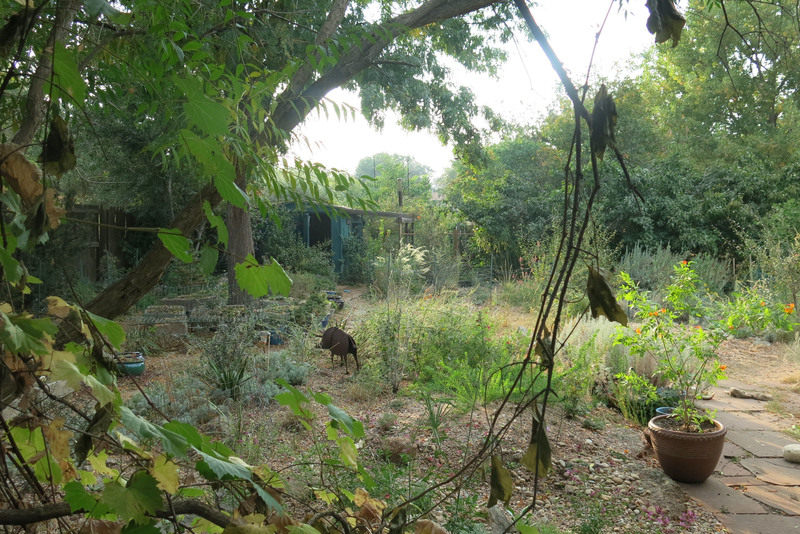 The garden looks fascinating. PS. I used to put some yummy soft food inside a Kong and freeze it. Then my dog friend, Bertie Woofter (a silly black lab) would spend hours licking the yummy food out. I also had some supposedly unbreakable hollow bones for the same purpose but I’d check up on their safety for a dog as fierce at chewing as you are. The guy I live with has heard of peanut butter in Kongs, but I really like the new toys. On the other hand, peanut butter sounds pretty good. Peanut butter was a hit with Bertie Woofter. it is with every dog, I do believe. Thanks; they came and fixed the internet today. As you can tell. The guy I live with mostly posts in the bulb group (Bulborum) because that’s the main action around here, aside from dozens of forms of Salvia greggii, which refuse to have their pictures taken. I have been following his bulb posts as I get a notification every time he posts to Bulborum. I wonder why the Salvias are so camera shy? The salvias are red, and the point-and-shoot doesn’t do red so well. Or maybe I should say he doesn’t know how to fix the red afterwards. And really, they would need some rain to be super flowery, because that’s how they grow in real life. Oh I pictured blue in my mind. Red, dark red, reddish pink, pinkish red. What I admire in the guy you live with, Mani, is his adamant keeping to the decision not to water the dry-climate landscape even when the weather stays extra crispy. Hewing to philosophy is inspiring. 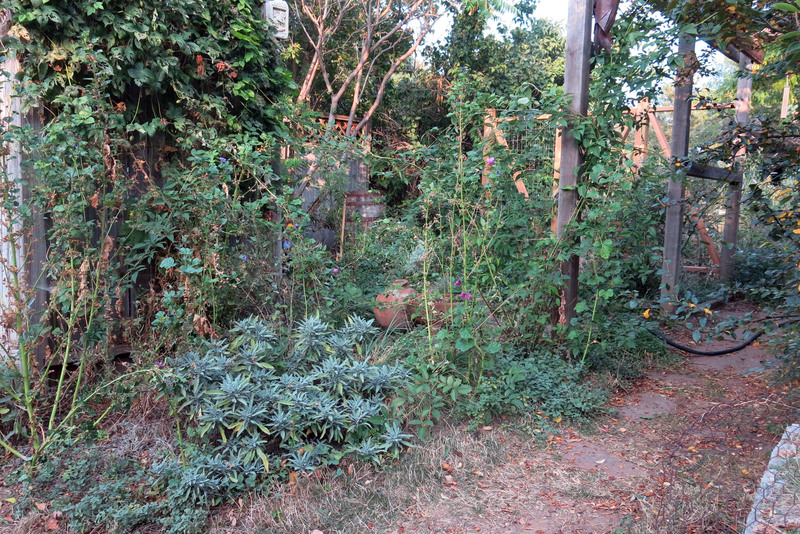 Of course, it rained here today, not a lot, but our garden is no longer extra crispy. The native plant sale is in two weeks, and plans are to buy, buy, buy. I usually plant in the rain, and I hope the weather cooperates. 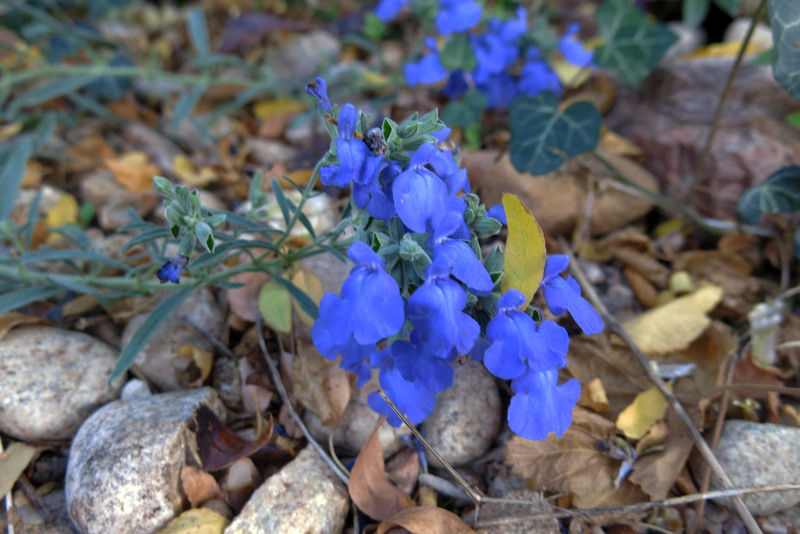 Love the blue of the salvia. I wonder if lodging is the reason our asters lie prone. I really fight to add micorrhizae to our soil, and it is lowering to think I’ve failed. Your garden really looks good, Mani, even extra crispy.